This week, learn how to knit the Fair Isle technique in the round – a fantastic way to add motifs to socks, gloves and garments! Fair Isle is a knitting technique that allows you to knit with two or more colours across a row creating beautiful patterns. A traditional Fair Isle pattern uses only two colours per row and has a small number of stitches between each colour change. Fair Isle is knitted in stocking stitch and produces warm double thickness fabric due to carrying the yarns not in use across the back, but the art of good Fair Isle is not to pull the yarns too tightly, so you achieve fabric that is elastic and not puckered. I have found the easiest way to knit Fair Isle in the round is using the two-handed method, it is a little be tricky to master this technique at first, but it is worth the effort as this method is very quick and produces very even work. Not only that, but by knitting in the round you can see the pattern better which allows you to spot mistakes, stranding your colours and knitting using the two-handed method is easier on a knit stitch, and this is the technique I would like to teach you today. Fair Isle patterns are charted, and we will work from the chart below which is a round chart and is read from right to left. 4mm Double Pointed Needles and small amounts of 2 colours, I’m using Cascade 220 Aran. The contrast colour should always be carried from the beginning of a round, even if the colour isn’t used for a few stitches, this will ensure that the thickness of fabric is consistent. Join the contrast colour by placing it on top of the main colour or you can join the new yarn by a little knot which you can undo at the end of work and weave in the end. Before we start knitting in pattern using two colours we must decide which will be our dominant colour. It is paramount in Fair Isle knitting that the two yarns are held consistently, one colour will be held on top and the other below. The yarn held below will have a slightly longer stitch, which means that this colour will be more dominant and will ‘’pop’’ more. So if you would like the motif to stand out pick this yarn from below the background yarn. In my sample I want yarn B (burgundy) to be dominant and yarn A (grey) to be the background so yarn B is held below yarn A. Now we have chosen our dominant colour is time to place them in the correct hands and start knitting. When you knit Fair Isle using the two-handed method the dominant colour (B) is held in the left hand and the background colour (A) is held in the right hand. Place the yarns on the corresponding sides of work, this will prevent them from tangling. Place yarn A in your right hand and yarn B over the index finger of your left hand. You will knit the stitches with yarn A as normal and when yarn B is needed simply place the right-hand needle over yarn B and bring the yarn through the stitch, just as in continental knitting. Continue from chart to round 7. If you look at round 8 of our chart you will notice that the spaces between colour changes are 7 stitches long. We must still carry yarn B with us all the way, so it is important that we strand yarn A every 3 sts at the back of the work to prevent big loops forming. There is a very simple way of doing this when you are knitting Fair Isle using the two-handed method. Work 3 stitches in yarn A and insert right-hand needle into the 4th stitch as normal, place yarn B on top of the needle. As you finish the stitch make sure that yarn B doesn’t come through as well. Knit the next stitch to lock the yarn in place. As you can see in the pic above yarn B is neatly placed on top of yarn A. Tip: when you pull tightly on yarns your work will pucker, to prevent this simply spread the stitches on your right-hand needle every few stitches. Why not try practising your newly gained technique on these fab Annys gloves which I designed exclusively for the LoveKnitting app? Read more about the LoveKnitting app for iPad and iPhone! Anna Nikipirowicz Anna Nikipirowicz was taught to knit and crochet as a child by her very talented mother, and now she is an author, designer and workshop tutor, teaching knitting and crochet across the UK. 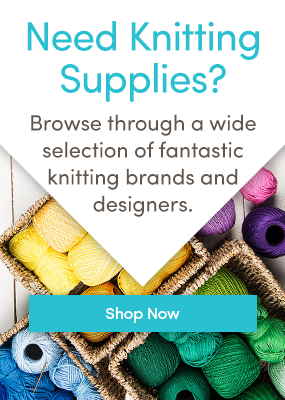 You can find Anna at Moochka.co.uk, where she shares her love of yarn, knitting and crochet! Last updated: January 16th, 2017. I love knitting. My MIL taught me many years ago. Today I am taking my 6 year old Grandson for his first lesson. He is left handed so when I tried to teach him it wasn’t as good experience as I had hoped for. The instructor today teaches both left and right handed. What do you think of that? Good idea or really shouldn’t matter? lefty do it differently – you have to use two hands! I teach lot of left handed people and very often they will acctually use the right handed method, as at some point they were shown by their family member how to knit this way. However, I always found very helpful when teaching a left handed method to sit directly in front of the person so they mirror everything you do. Hope that helps and don’t give up, you are creating wonderful memories, I remember very fondly the time my grandma was teaching me how to knit. I would love to knit these fair isle gloves. Unfortunately I have an android tablet and phone – no apple products. Fantastic advice. Am currently knitting the lopi Iceland gloves.Its my first time using dpns and admit that keeping track of the two strands and balls was tricky and time consuming. Can’t wait to try this out! Glad I could help 🙂 Enjoy knitting your gloves, Fair isle knitting is so exciting. The Fair Isle “practice” chart would make a great excercise to learn steeking. Would it be possible to convert it into a steeking chart and, even better, add a “how to” blog post to it? Hi, I usually add 5 stitches for the steek. I reinforce the steek with the crochet method and cut in the centre stitch, Then pick up and knit from the ends of pattern, which causes the 2 stitches on each side of the steek to fold in nicely, but I promise I’ll do a tutorial on steeking. This looks fantastic but i also have an android so can’t use the app. When is the app due to be released for android? Shiver me timbers, them’s some great innfmratioo.